Spread the word! Share our website and facebook page. Share the news with individuals that can benefit from a grant. Join our crew to help us on the day of the race and support the athletes. Be a cheerleader for our team and come out to cheer us on. Businesses can make donations of goods and or services to support our team. Make a tax deductable monetary contribution to Challenged Athletes Foundation in Joshua's name by visiting ﻿www.sdtc14.kintera.org/joshuamiller﻿. Connect us with organizations and businesses that have a charitable contribution allowance and would like to make a tax deductable gift and join with us and support Team JJ. 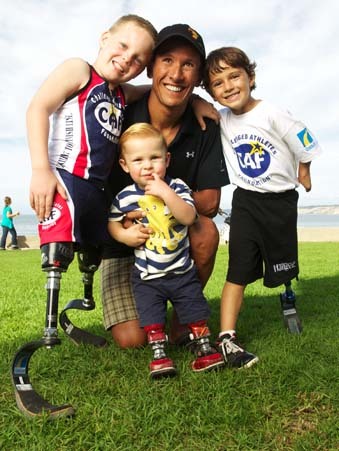 Joshua at 2 years old with Cody McCasland from Team Cody, Chris "MACCA" McCormack, a 2-time Ford Ironman World Champion, and Ezra Frech from Team Ezra at the 18th Annual San Diego Triathlon Challenge in La Jolla Cove, October 2010.